Eh, who cares. We still have Constantinople for another thousand years. Re-assert authority over lost territory. BELISARIUS = Greatest. General. Ever. -Quick conquest of Vandal, HUGE influx of ka-ching! -If we can retake Africa…then what else? War drags on for 20+ years. -LOL this sends Italy to the stone age! Dark Ages for the win! -Cataphract. Fucker horse units for Persia! Also star in Civilization games. May have payed off the Persians to get them to go away….a few times. -Iberia, as buffer state. If they get invaded immobilize! Lazica too. 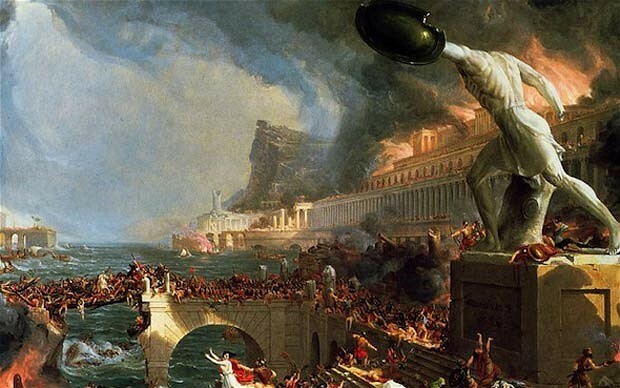 -Persian wars continue until 641 AD happens and Persia goes bye. Get involved with Religion. And all of its disputes. Last to govern in Latin. After him it is all Greek. On Christmas Eve of 820, the Emperor Leo V condemned the pretender Michael II to death by the rather bizarre method of having him tied to an ape and thrown into the furnaces that heated the imperial baths. Before the execution could take place, Michael’s supporters dressed up as monks and crept into the imperial palace to attack the emperor. Leo reportedly defended himself for more than an hour armed with nothing but a heavy metal cross that he swung around wildly before succumbing to the blades of his assailants. In what was surely the most undignified coronation in Byzantine history, Michael II was hastily brought up from the dungeons and crowned with the chains of his captivity still around his legs. Found in Lost to the West: The Forgotten Byzantine Empire That Rescued Western Civilization written by Lars Brownworth.